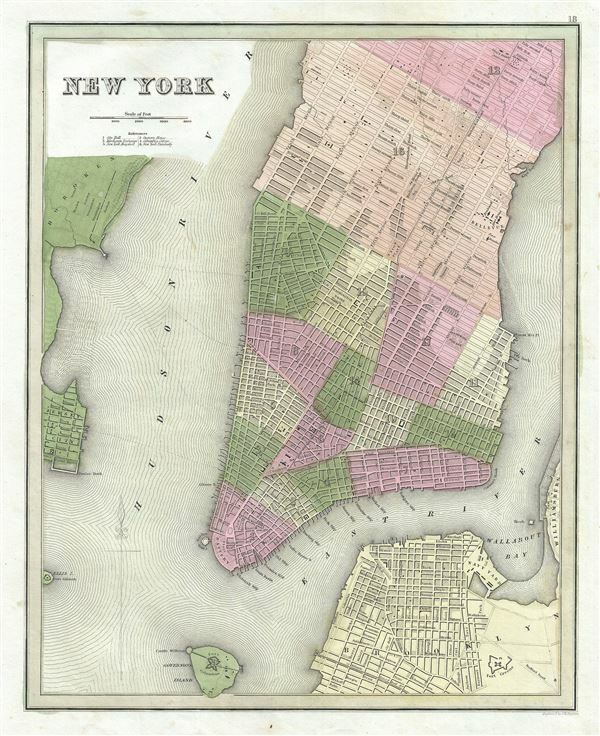 One of the more attractive 19th century atlas maps of New York City. This is Thomas Bradford's important 1839 map of New York City. Bradford's plan covers Manhattan from 53rd Street to the Battery, with parts of adjacent Brooklyn, Hoboken, and Jersey City. The whole is beautifully engraved in Boynton's delicate style, with important buildings, parks, streets, rail lines, and piers noted. Predates the landfills along the East River and on the Jersey side of the Hudson - though these are in fact ghosted in. Identifies Fort Green, the Navy yard in Brooklyn, Fort Columbus on Governor's Island, Fort Gibson on Ellis Island, City Hall, Bellevue Hospital, the Public Cemetery, the Deaf and Dumb Asylum, Tompkins Square Park, Washington Square, Castle Garden, and the Battery, among others. The Harlem Railroad appears in its original configuration extending along Fourth Avenue and then the Bowery to City Hall Park. Fine color work defines city wards of which there are but 17. This map became the prototype for a number of other important later maps of New York City by Tanner, Mitchell, and others. Engraved as plant no. 18 for the 1839 issue of Bradford's Illustrated Atlas. Bradford, T., An Illustrated Atlas, Geographical, Statistical, And Historical, Of The United States And The Adjacent Countries, (New York) 1839. Very good. Blank on verso. Pressmark visible. Haskel, D. C., Manhattan Maps, A Co-operative List, 825. 826. 827. Rumsey 0089.001 . Phillps (atlases) 1381.